In a single candlestick pattern, the trader needed just one candlestick to identify a trading opportunity. However when analyzing multiple candlestick patterns, the trader needs 2 or sometimes 3 candlesticks to identify a trading opportunity. This means the trading opportunity evolves over a minimum of 2 trading sessions. The engulfing pattern is the first multiple candlestick pattern that we need to look into. The engulfing pattern needs 2 trading sessions to evolve. In a typical engulfing pattern, you will find a small candle on day 1 and a relatively long candle on day 2 which appears as if it engulfs the candle on day 1. If the engulfing pattern appears at the bottom of the trend, it is called the “Bullish Engulfing” pattern. If the engulfing pattern appears at the top end of the trend, it is called the “Bearish Engulfing” pattern. Needless to say, once the trade has been initiated you will have to wait until the target has been hit or the stoploss has been breached. Of course, one can always trail the stop loss to lock in profits. Have a look at DLF’s chart below; the bullish engulfing pattern is encircled. The OHLC on P1 – Open = 163, High = 168, Low = 158.5, Close = 160. On P2 the OHLC details are – Open = 159.5, High = 170.2, Low = 159, Close = 169. One, the current market price at 3:20PM on P2 should be higher than P1’s open. In this example, both the risk averse and the risk taker would have been profitable. Here is an example of a perfect bullish engulfing pattern formed on Cipla Ltd, the risk averse trader would have completely missed out a great trading opportunity. There is often a lot of confusion on whether the candle should engulf just the real body or the whole candle, including the lower and upper shadows. In my personal experience, as long as the real bodies are engulfed, I would be happy to classify the candle as a bullish engulfing pattern. Of course, candlestick sticklers would object to this but what really matters is how well you hone your skills in trading with a particular candlestick pattern. So going by that thought, I’d be happy to classify the following pattern as a bullish engulfing pattern, even though the shadows are not engulfed. The bearish engulfing pattern is a two candlestick pattern which appears at the top end of the trend, thus making it a bearish pattern. The thought process remains very similar to the bullish engulfing pattern, except one has to think about it from a shorting perspective. Take a look at the chart below of Ambuja Cements. There are two bearish engulfing patterns formed. The first pattern on the chart (encircled, starting from left) did not work in favor of a risk taker. However the risk averse would have completely avoided taking the trade. The second bearish engulfing pattern would have been profitable for both the risk taker and the risk averse. The stoploss in both the cases will the highest high of P1 and P2, which in this case is at 221. Both the risk averse and the risk taker would have been profitable in this particular case. Take a look at the chart, what are the things that catch your attention? What implication would a doji have in this chart? On day 3, let us call it as P3, though the opening is weak it is not much lower compared to P2’s close. This is not too comforting for the bulls, as they expect the markets to be stronger. From my own personal trading experience I can tell you that whenever a doji follows a recognizable candlestick pattern, the opportunity created is bigger. Besides illustrating this point, I also want to draw your attention to chart analysis methodology. Notice in this particular chart, we did not just look at what was happening on P1 or P2 but we went beyond that and actually combined two different patterns to develop a comprehensive view on the market. The piercing pattern is very similar to the bullish engulfing pattern with a very minor variation. In a bullish engulfing pattern the P2’s blue candle engulfs P1’s red candle completely. However in a piercing pattern P2’s blue candle partially engulfs P1’s red candle, however the engulfing should be between 50% and less than 100%. You can validate this visually or calculate the same. For example if P1’s range (Open – Close) is 12 , P2’s range should be at least 6 or higher but below 12. As long as this condition is satisfied, everything else is similar to the bullish engulfing including the trade set up. Here a risk taker would initiate the trade on P2 around the close. The risk averse would initiate the trade, the day after P2 only after ensuring a blue candle is formed. The stoploss would be the low of the pattern. Here P2’s blue candle engulfs just under 50% of P1’s red candle. For this reason we do not consider this as a piercing pattern. The dark cloud cover is very similar to the bearish engulfing pattern with a minor variation. 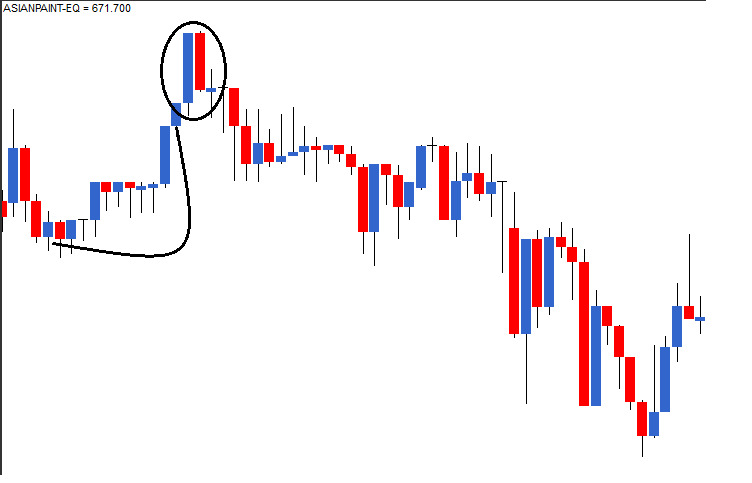 In a bearish engulfing pattern the red candle on P2 engulfs P1’s blue candle completely. However in a dark cloud cover, the red candle on P2 engulfs about 50 to 100% of P1’s blue candle. The trade set up is exactly the same as the bearish engulfing pattern. Think about the dark cloud cover as the inverse of a piercing pattern. Typically stocks in the same sector have similar price movement. For example, think about TCS and Infosys or ICICI Bank and HDFC bank. Their price movement is similar because these companies are more or less of the same size, have similar business, and the same external factors that affect their business. However this does not mean their stock price movement would match point to point. For example if there is negative news in the banking sector, banking stocks are bound to fall. In such a scenario if the stock price of ICICI Bank falls by 2%, it is not really necessary that HDFC Bank’s stock price should also fall exactly 2%. Probably HDFC Bank stock price may fall by 1.5% or 2.5%. Hence the two stocks may form 2 different (but somewhat similar) candlestick patterns such as a bearish engulfing and dark cloud cover at the same time. Both these are recognisable candlestick patterns but if I were to choose between the two patterns to set up a trade. I would put my money on the bearish engulfing pattern as opposed to a dark cloud cover. This is because the bearishness in a bearish engulfing pattern is more pronounced (due to the fact that it engulfs the previous day’s entire candle). On the same lines I would choose a bullish engulfing pattern over a piercing pattern. However there is an exception to this selection criterion. Later in this module I will introduce a 6 point trading checklist. A trade should satisfy at least 3 to 4 points on this checklist for it to be considered as a qualified trade. Keeping this point in perspective, assume there is a situation where the ICICI Bank stock forms a piercing pattern and the HDFC Bank stock forms a bullish engulfing pattern. Naturally one would be tempted to trade the bullish engulfing pattern, however if the HDFC Bank stock satisfies 3 checklist points, and ICICI Bank stock satisfies 4 checklist points, I would go ahead with the ICICI Bank stock even though it forms a less convincing candlestick pattern. On the other hand, if both the stocks satisfy 4 checklist points I will go ahead with the HDFC Bank trade. The presence of a doji after an engulfing pattern tends to catalyze the pattern’s evolution. The dark cloud cover works similar to the bearish engulfing pattern, except that P2’s red candle engulfs at least 50% and below 100% of P1’s blue candle. Can i call the circled one as a bullish engulfing pattern??? No Sir. Bullish Engulfing pattern needs a prior down trend and the 2nd candle should completely engulf the previous candle. Both these are missing. Hence I ‘m afraid you can call this a bullish engulfing pattern. Thanks sir. Do you mean the shadows of the bearish candle should also be engulfed?? The green body must completely engulf the previous red candle body. And as Sir said there must be a prior trend, here the stock is trading in a range. Yeah. Its from amibroker Nitesh. Hello Sir, if the bearish engulfing pattern appears at the bottom of downtrend in a stock at 52 Week lows, so can this be considered for more deepening of downtrend? Tricky call, but I’d be tempted to do so. If there’s an engulfing pattern during the day and not at around 3.20 pm should we seize the opportunity to go long or wait ? You need to wait, what if by the end of the day, the candle formed is something else? Can the Candlestick of axis bank be considered as Bullish engulfing on the daily chart . The only thing not convincing about this is the prior trend, else everything is perfect. am i Right in Saying that in the Below Coalindia 3 Month Chart we have 2 Bearish Engulfing and 1 Bullish engulfing . from Nitesh screenshot, First and Second didn’t form an engulfing pattern due to prior trend. Am I correct? but the third one did form a bearish engulfing pattern. Am I correct? Thanks for the contents Karthik, it is wonderfull. Given that there are 1000’s of listed stocks. How do we go about looking into these patterns in these stocks. Is it practically possible to scan each one of the stocks for these patterns? Can this Multiple candlestick be used in intraday also or they can be used only in 2 or 3 days basis as saw for Morning and evening star its mentioned for 3 days , means 3 candles for 3 days ? Can very well be used on a intra day basis. Sir, which candlestick pattern is more convincing downtrend or uptrend assumption. here p1 high=168 is less than p2 close =169 but p1 high is above p2 close in graph, also the lower shadow on p2 candle is missing. Could you please name the company whose candlesticks you’re describing? Thank you verymuch Mr Karthi Rangappa . My Hearty Wishes for a happy and prosperous NEW YEAR to You and Your Family. Thanks Mani. Wishing you the same. Hi Karthik, Thank you for clearing yesterday’s query in previous chapter. You have clearly explained about the stop loss limit that we need to put while following these patterns… what about the target… Could you please advise? Thank you. In fact the chapter on Support & Resistance talks about setting targets. I would advice you to read through it sequentially, chapter by chapter to appreciate it fully. many many thanks for your valuable support. Yes, I have done it . In the 4th chart, before the bullish engulfing pattern, is there a failed bullish harami pattern after 5 consecutive red candles. Thanks in advance. That’s good spotting :). Yes, it seems to be a failed bullish harami pattern. Do you want me to tell you why your trade wasn’t worked out ? Please do share your insights for everybodys benefit. First of all, I thank you for this wonderful initiative . Is this a bearish engulfing pattern with presence of a doji? This is great and information is pretty much insightful. I was following Technical Analysis textbook, but what it lacks is real market experiences. Thank you for this. Given the range bound in intraday trading and using these technicalities, we have to do multiple trades. Don’t you think making these many trades will be taken away by brokerage charges and other expenses. As a retail investor, can I have some suggestions? Yes, in a range bound market trades can get a bit choppy. So one has to be quick to realize this. Also, if you are actively day trading then you have to ensure your costs are low. Make sure you are with a broker who not only charges you less broker but also less transaction charge. Can you tell me Which Technical Text book you have? Have quite a few, Steve Nison’s book on candlesticks is one of the best. As you said, any pattern with doji formation will create a great opportunity,Please have a look on the attached chart and let me know my identification (Bullish Engulfing Pattern along with Doji on P3) is correct or not and also tell me what i need to follow if i want to take a long position on the same? Yes, I agree..but you should have initiated a long trade on the day of the doji formation. The chart pattern looks attractive though. Good luck. Seriously, one cannot advice on trading positions as per SEBI guidelines!? Then how do the people on business news channels advise the people to buy or sell some specific stocks!? To that you need to be registered as an Investment Adviser or a Research Analyst. I suppose they have the required registration. Thanks in advance for your help and for these wonderful set of explanations. also, because of your detailed level answering, learning has been on an additional pace. So, I was checking on the TVS scrip after the doji formation and found that prices fell for next few sessions. Is it because the close of P2 and open of P3 had significant difference. If yes, is there a range? Romi – It could be attributed to that. Also do remember there is a fundamental angle here – TVS is a Chennai based company and unfortunately because of the floods in Chennai both sales and production have taken a hit. Thanks in advance for such initiative. also, with these Q&As, learning has been on an additional pace. My query is on the above chart where a doji is formed. when I checked the historical prices, there was a fall for a few sessions post the pattern formation. Was it because the P3(Open) and P2(Close) had reasonable difference? If yes, what is the range? Guess you were talking about TVS, have already posted to an answer to that. Thanks for the Reply and for your support. which pattern is this is a hammer or piercing pattern? Both these conditions do not match, hence not a piercing pattern. It looks more like a hammer – but then it would have been so much better if the opening of the pattern day was lower than the previous days low. However with some amount of flexibility you can consider this as a hammer. Sir,Thanks for this wonderful series. With regards to the above ,I feel it does not look like a hammer considering that the length of the wick is not even twice of the length of the body! Am I missing something? Yes, for hammer the length of shadow should be at least twice the length of the real body. which pattern is this is a bullish engulf? Yes, this certainly looks like a bullish engulfing pattern. What is the 6 point trading checklist a trade should satisfy (at least 3 to 4 points out of 6) for it to be considered as a qualified trade. plz reply. Here is the 6 point check like that – http://zerodha.com/varsity/chapter/dow-theory-part-2/. I would like to see at least 3 things out of these – recognizable candlestick pattern, S&R, and Volumes. On the below chart for AuroPharma there was perfect bearish engulfing happened. Also you can see there was spinning top on third day, yet the stock has not fallen. What should i do when such situation arises. If I were you I would hold on to it as the stoploss is still in tact (1375 as SL). Rememebr after initiating the trade you have to exit only when your SL is triggered or target is achieved…so just wait for the trade to evolve. According to me everything seems to be ok here. However, in case the trade goes against you, be prepared to cut your losses ard 1375. Good luck. you suggest to hold on to the trade. But since its a short, it would be squared off at the end of the day right? so, hewould be getting loss at the end of first candle., and cant do anything. Please correct me if i am wrong. hi sir actually ididnt get the point 3,point 4 why r u saying that is encouraging? Can you please requote the lines here? Thanks. Very glad to know this, hope more success comes your way! Good luck. I did real trade also in Crude oil its giving good profit. This appears to be ‘almost’ like a bullish engulfing pattern, it certain seems to show strength. Although there is no name for this pattern (or at least I dont know) you can still treat this as it is a recognizable candlestick pattern (as you have tracked it over and over again). Please make sure other checklist items comply before you initiate the trade. Good luck. The situation decribed by the Katrikey Is it not like a Piercing Pattern?? It seems so I guess. Can someone suggest me Real Time Intraday Commodity Charts provider??? Which provider is the right one to provide metastock platform??? Check out Viratech software, they are quite good. Can someone suggest me which provider is the right one to provide metastock platform??? Viratech Software provides Metastock data, I have personally used their services and they are quite reliable. Thanx a lot Karthik Sir. I’m rocking in market karthik sir… Here I’m sending bearish engulfing pattern…..
with all my heart thank you karthik ji….very useful ta study material. Sory, Monthly chart not weekly chart sir..
Glad to know this Girish. Good luck and I hope you find more success. thank you karthik sir 🙂 …..
Really find this website interesting. I know learning TA and mastering it is not easy, but slowly getting there. Thanks for the material. If I’m going short on day’s end. Say 3:20pm. Will it get squared off by 3:30. I’ve been told that shorting is only possible in intra day trade and not in delivery ones. Thats right. Hence all shorts (for overnight positions) should be in futures. Karthik, can the last candle be classified as a piercing pattern? it seems to be withing the support zone. is the volume substantial? the RSI is reversing from the oversold line too. compelling to go long? Hi Karthik, I really appreciate your work and knowledge and most importantly yours sharing those knowledge to others :-). My query is of today’s DLF chart and want to confirm if the below DLF chart shows Bullish Engulfing or is there anything more to confirm the same. If its indeed bullish sign, so can i say it will atleast touch 150 in week or 2? Thank you, knowledge should be shared freely. 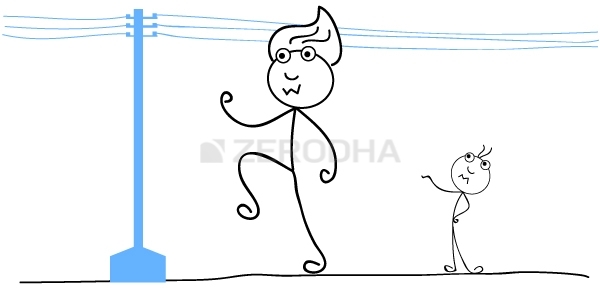 Have you read this – http://zerodha.com/z-connect/queries/stock-and-fo-queries/introducing-varsity ? It talks about the philosophy behind Varsity. Anyway, the pattern resemble a bullish harami rather than a bullish engulfing pattern. You also need to check the volume status before taking a call on the stock. I see a resistance at 145/- so 150 seems a bit challenging especially given the fact we are in weak markets. Karhik, a bullish harami formed with strong volume near the support, RSI at oversold. Though the stock opened with a gap up the next day, it was a doji. followed by a bearish candle with low volume today. what do you make of it? how does one trade this? I would be inclined to go long but since the markets are a bit weak I would not be comfortable trading futures or spot. I would instead trade slightly OTM call option here. I am going through all the modules once again. Could you please justify your above statement as to if market is weak going long on call is better option. How? Weak markets implies low premium value for call options…in case your expect a market rebound, then buying calls makes sense. What are the differences between single and multiple candlestick patterns? And which one is more reliable? And how does bullish engulfing pattern differ from hammer ? And bearish engulfing pattern from hanging man? In the chart i have highlighted the Bullish engulfing pattern. The pattern formed after the formation of 5-6 candles downtrend. But the volume of the green candle is not sufficient. While considering the bullish engulfing pattern whether the first red candle volume to be considered or the second green? The volumes should certainly be good for the 2nd green candle. 2) The green candle should have opened below the red candle’s close and then moved to a price point higher than the red candles’s opening. Karthik Sir…Which Chart are you discussing as i am not finding any chart here???? Also in many comments i saw people are discussing charts they have posted but i am not able to see any of those. Why is that???? The charts are all showing up, can you please refresh your browser and check once? Sir i have tried everything like updating browser, tried other browsers also and finally even i switched to another device to see if problem is with my device but nothing worked for me. Charts which you used for explanations are visible but rest on comments are not showing up at all.I cannot even see option to upload image. Ah, not sure Vishal. Let me check this on multiple systems here. Same issue for me like Vishal Saini, I couldn’t see any images in the comment area, neither an option to add an image. Tried Chrome/Mozilla latest versions . Will get this checked soon. Thanks. Actually, even I am not able to see the charts posted here, by other people. Also could you guide as to how I can attach a chart in my query here? People usually upload the pics on Gdrive and share the link here. That works. Kindly click on the symbol which looks somewhat like a comma below the comment. In a PIERCING pattern, the blue candle should be more than 50% but less than 100% of the previous red candle (it is a bullish sign)…..If the blue candle is 100% or more than 100% then it is BULLISH ENGULFING pattern. 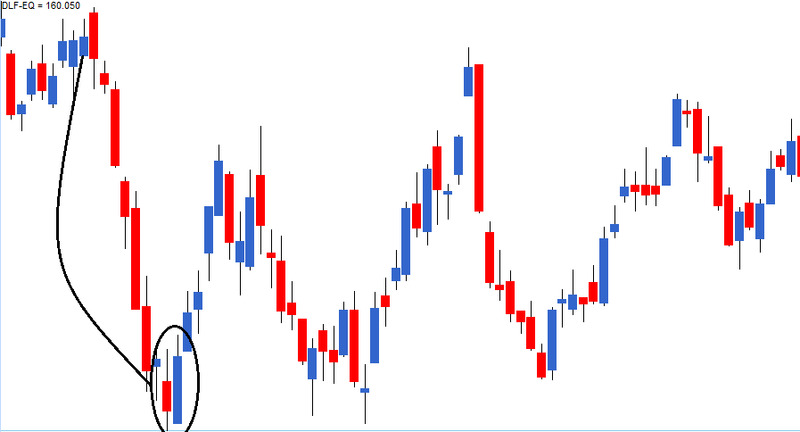 If the blue candle is less than 50% but within the red candle body, then it is a BULLISH HARAMI pattern…right? Same logic (in opposite way) for in an uptrend . Yup, the understanding seems to be right. But please do make sure the other variables confirm before taking the trade. What other variables we should consider ? These are good for a start, Nikhil. Karthik can the second last bearish candle be treated as a failed dark cover? or do you think the side ways trend negates it? appreciate the library. but, in the above chart do you think the trend was sideways before the DCC and hence the pattern should not have been considered? 1) After a good upmove, the stock was stuck in a range with low volumes – I would naturally tend to look for breakouts. 2) The preceding few candles were stuck in a range, so as you mentioned it is not very comforting. Hence I’d tend to avoid. sir how should we select the shares trade in?? To begin with I would suggest you stick to Nifty 50 – they are liquid and easy to trade actively. sir how do i set a target for engulfing patterns? One of the easiest ways to set targets is to identify the nearest resistance or support levels. Karthik, a Dark cloud cover? the volumes were lower than the average on the pattern formation day though . the stock did correct the next day with a doji. how would you have traded the DCC day? This looks good Madhu, I would be tempted to set up a short trade on this – but the over all market seems to be positive. Hence shorting futures is ruled out. Hence I’d be happy to buy the ATM Puts. Sir, DId not get the logic here. Market is positive so trading in options better? If I see a pattern why shouldn’t I short in Futures? The risk reward of Futures and Options are very different. You have an unlimited risk in Futures, while in options the risk is limited. Hence people prefer options over futures. One, the current market price at 3:20PM on P2 should be higher than P1’s close. Shouldn’t CMP at 3:20 be higher than P1’s Open and not Close? Oh yes, thanks for pointing it. Will makes the change. Mr. Karthik, how many of these candlestick patterns can be considered for intraday trading. i am more keen on that. Almost all of it can be considered for intraday! And for intraday whats the best Data interval to be used? 5, 15 mins or 30 min candles? As you said no sure method to know whethet the trade shall be possitive or negative. But we must look for odds by which we can have a positive trade. Your method of teaching is very fine and one can understand it well.After learning from you about the candlesticks,we need to know those odds.you may be talking about the technical analysis which we should know about each commodity.Which is difficult for all commodities.We must concentrate on one or to technicaly analyse those.For this we need to know about the reasonable data. 2And do we have a software which could calculate standard deviation or other factors taught by you. 3 if we know all this then possibly we could get a positive trade. The SD can be calculated using excel. Please find attached the daily chart for crude oil. Let me know your take on this please. Would be of interest to know how you would look at this chart. I see a hammer at the bottom there and a doji. Would you have gone long seeing this pattern mate? It would take lots of guts to go long looking at that tiny hammer. I would not have. However after the 1st green candle, I may have initiated a long trade. I have been surfing through charts after going though the whole module and I have noticed that especially on intraday charts you get to observe plenty of patterns through the day. Some of them give good results, some don’t. With your experience trading the markets, how would you rate these candlestick patterns? I read that you prefer the hammer over a hanging man. Likewise, which patterns would you consider the strongest and which would be second on your list. Nayan- honestly speaking simple S&R levels work well for intraday…combine it with patters such as engulfing, piercing, hammer, and hanging man. Also just make sure that you know which pattern to use for which stocks. Remember not all patterns work for all stocks….for example Bullish engulfing may work well for ICICI but may not work on HDFC. So make sure you get this part right. Yeah, I need to start making a list of the stocks v/s the pattern. But I guess that would come from experience isn’t it? The more you read through charts, the more you know which pattern works for which charts. Sir am i correct ? Uday – the 1st one Bearish Engulfing pattern looks ok as long there is a prior up trend to it. Shouldn’t the six one be a piercing pattern? Which six are you referring too? 6th oct i have seen Bearish Engulfing pattern occurred in this share. But today 7th oct it will not go further down. In the 8.4(Presence of Doji), you did not mention whether we have to take position or short position. As per your saying, whenever a Doji is formed one should look for trading opportunity, but I am not able to get whether to buy or sell at that point. Please clarify. Thanks. The presence of a Doji after a recognizable candlestick pattern only strengthens the pattern. For example a doji after Bullish engulfing builds a stronger case for buying. Is a green candle after bullish engulfing seems more positive signal than a doji after a bullish engulfing, since doji has some uncertainty whereas green candle denotes positiveness on bulls ? The presence of doji causes more panic to bears and kind of creates a desperation to square off the position. This usually leads to a sharper rally. Thanks Karthick , that sounds logical . Now I take Doji candle after other pattern to be a stronger signal than any other candle. I am new to charting. Can you please explain from this live chart, what is the trend for the stock and how can one trade into it. Chirayu I’m afraid my response may confuse you more 🙂 – I would suggest you start from chapter 1 and follow the flow. Please do respond, I will start with chapter 1 and then use your response as validating the learning. That way I will re-nforce the learning. Looks like the stock is bottoming out! 2) The stock made a high of 573 today and closed at 550 today ( of course NIFTY also went down today). I saw that the 5 day EMA crossed the 20 day EMA on october 13th. The fact that the stock is not making new lows indicates that its bottoming out. So when can we enter this stock. Are there any visible patterns ? Can i Consider the attached Just Dial Chart formed a Bearish Engulfing Pattern? Yup, looks like a good candidate to short. Do make sure other parameters are verified. 8th candle from Last, Can i consider that candle as a Doji or Hanging Man? From the 8th Candle, Again market is in Downtrend as per the chart, but as a basic rule for forming the bearish Engulfing pattern, The prior trend should be Up Trend? I am confusing whether to take last 8 candles or not, So please let me know, to check whether a particular signal has formed or not, How many candles i should consider? Yes, the 8th candle from last is a doji. In this case even though the last 8 candles form a downtrend …and therefore the prior trend criteria does not really qualify. However if you look at the generic trend you will realize that the stock is in a good up trend and more recently there is some sort of exhaustion in the rally. So you may want to take notice of this and initiate the trade. Thanks Karthik. With this pattern can we trade in options? Because i want to take less risk with very limited capital. Mean while i will read Options module. In Nseindia.com i used to get a Options PDFs(In education) but these are not available now. If you have that copy please give it to me. You can, in fact have a look at this chapter http://zerodha.com/varsity/chapter/case-studies-wrapping-it-all-up/ . Sorry, dont think I have the PDFs as well. If you see in Futures & Options, For each month there is a separate lot size is appearing. How they decide for this month, this is the lot size for particular script? Is there any formula for this? No, lot sizes are same across different months. However the lot sizes are changing in November hence you see different lot size for Oct and Nov. From Nov onwards you will observe all lot sizes to be the same. Can i consider the candle which is 2nd candle from last as a Doji or Hanging man? The candle look like a paper umbrella. Can i expect circled one as a Support for this Stock as it has formed Bearish Engulfing pattern with Doji with increased volumes? It looks like correct opportunity for me to enter the trade(Paper trade)? Entering the Trade at 991.5 Target 760 – 780, SL 1058.Please correct me if my support position is wrong? In fact the stock has formed a double bottom (encircled area). Can i Consider Attached Ambuja Chart has formed Bullish Engulfing Pattern? Sorry to ask this type of queries..I am in dilemma whether to consider it or not because the present trend is sideways for me in the chart from last few candles.. Since there is no prior trend I would not consider this as bullish engulfing. What is Free float Market Cap(crs) which is showing in Nseindia.com for every script? (any engulfing pattern with Doji will give good opprtunity)To day just dial has given proved that. Will it be applicable to only for engulfing pattern or any other patterns will it applicable?..Here one more chart with Bullish Engulfing Pattern..Am i right? Once again Thanks for your patience,,really i am getting confidence..
Any recogonizable candlestick patter followed by doji tends to give good results. Good luck!! Yes, this is a key requirement. As I said, it does indicate indecision and most likely there could be a reversal…but you need to be prepared for both! If the pattern occurs at the top end of the rally, then its called Dark cloud cover. The one below is not a dark cloud cover. Same for piercing pattern. Can you also please tell if the thin body can be considered as shooting star in up trend? sir,can u tell me parameters for EMA,Bollinger Bands,MACD and please tell me Afl when close >EMA,Close>Bollinger Middle Band,Close>Macd Line this is buy situation . Suggest you reach out to [email protected] for this. At best you can consider this as a bullish Harami, please look for confirmation from other items on the checklist before going long. The hammer is not really convincing Anand, the ratio of lower shadow to the real body does not seem to be ok.
One of the prerequisites for DCC is that the open on P2 should be higher than the close of P1, which is missing here. For this reason I would be hesitant to call this a DCC pattern. The volumes seems ok.
For a Engulfing Pattern both bullish and bearish how to set a profit target. The immediate Support and Resistance level usually acts as a target level. Can we consider the last 2 cadles of SBI chart as a Piercing pattern? Not really, in piercing pattern the candle on P2 should open below P1’s close and then move up to close at least higher than 50% of P1’s range. Since this is missing in SBI, its not really a Piercing Pattern. Can you help me to identify the Support for Canara bank and confirm me whether it has formed a Bullish Engulfing Pattern or not? It seems ok for me, but i could not able to find support and volumes also low on last day.So please give me your insight on this..
Clearly there is no visible Support for Canara Bank. Yes, this looks like a bullish signal…I would set up an options trade here rather than naked future or spot market transaction. Please confirm me NTPC has formed a Bearish Engulfing pattern or not? As i draw some boxes, Please confirm me Whether my understanding is correct or not. these three points are align with our Bearish engulfing pattern(On the same zone) but low volumes on last day. Please provide me your insight on this? Both 1st and 2nd boxes refer to the same resistance level, which later turns out to be the support level. This explains why the stock is showing some signs of correction at the same level now. I would be bullish on the stock considering it has moved up in the recent past. Can i expect the trend has been reversed? Volumes are not encouraging but Resistance is ok for me in the zone of 147 to 140 in 1 year chart..please help me to identify Resistance for this or confirm me whether my resistance zone is correct or not. Here i am assuming like sell signal Entry at Rs-142/-,SL 147, Tgt 138..please give me your insight on this? Seems good, hope it works in your favor. Thanks Karthik..I will definitely read that module. Can you tell me your view on last candle of the Bharatforge? Is it a Doji or Paper Umbrella? Last previous candle is a Bearish Marubuzu, I am in dilemma whether it is a Bullish Harami or Maubuzu with Doji? At best this can be considered as a continuation of bearish trend as its not really a defined pattern. Last candle is certainly engulfing the previous one, it is also red. Yes, bearish engulfing pattern needs to appear on top of the chart. This one can be treated as a continuation of bearishness. Can you kindly confirm the patter weather it’s an bullish engulfing do I need to go long on this ?? For a Bullish Engulfing pattern, the opening on P2 should be lower than the close on P1. For this reason the pattern is not really a Bullish Engulfing pattern. in one of your previous comment(shown in the pic below..) you have asked the person to hold on to the stock till the SL is reached. But in shorting the trade has to be squared off the same day itself.. how then can we hold on?? You can hold short trades overnight via Futures. As Maruthi has formed, Bullish engulfing pattern with good volumes,What is your view on this? Certainly seems bullish, please do consider other checklist items before taking a trade. Can i consider the multiple candle sticks for 5 min chart.? I can understand for bullish engulfing trend should be down. But what if bullish engulfing pattern is formed in up-trend. And vice-versa for bearish engulfing. For example Lupin has formed bearish engulfing twice in last 7 days on daily chart when trend was donw. Prior trend is an important factor for the Pattern to work. I would suggest you ignore patterns which don’t comply to this rule. Is it possible to do a short trade at the close of day. I was thinking all short trades other that F&O get squared off at the end of day. Is there a chapter clarifying this ? If you short in spot market then you will have to square off by 3:20 PM, however you can carry forward your short position in Futures and Options. To day i have seen a Bearish engulfing pattern in Voltas(please confirm it from your end also) but volumes are 1,35,000 lower than last 10 daya avg volume? Can i consider this short trade even though volumes are low? It does, please do confirm if all the other parameters fall in line before initiating a short trade. Good luck. My Doubt is even though it is lower than the 10 days avg volume, Can i proceed up to what extent like if is below just 50,000 of last 10 days avg volume, can i proceed or not? Its best to compare today’s volume to recent past average volume….something like 10 days is good as it gives a good sense of whats happening in the recent past. Is HCL chart has formed a Piercing pattern? If possible please identify a support and resistance for me? Dont think so, the low was not really lower than P1 and I dont think P2 recovered 50% of the losses made on P1. I hope Drreddys formed a Morning star with increased volumes compared to last 10 days and SL is on support level and i am finding difficulties in finding targets(i know next resistance will act as target1), but unable to find a Resistance (target) and what are all other check points i should consider to take a trade other than Candle stick Pattern, Volumes ans S/R? It certainly qualifies for a long trade, I’d believe 3008 as the next resistance level..however you need to check the reward to risk ration before initiating the trade. These have been the most useful stuff i have ever come across related to stocks- right from the first module and I’m enjoying every bit of it. Eager to continue learning from the later modules as well. Thank you so much Karthik for the efforts you and the team have put in. Most welcome Pratik! Happy you liked the content here! 1. The Dark Cloud Cover formation requires the second day red candle to open above the highs of the first day candle, than only it forms a classic dark cloud cover pattern. Whereas in Bearish Engulfing Pattern the second day red candle needs to open above the first day’s close and not the high. I had a doubt what happens if its a dark cloud cover with a variation where the second day red candle opens above the previous day’s close and not above the highs. Will the pattern still hold significance? The same doubt applies to The Piercing Pattern? Tejas, in the whole module I’ve given importance to close/open, and not the high/low. This is not a hard fast rule, depends on your trading experience i guess. Images on the comments are not visible, earlier I have informed about it along with Vishal Saini in this page , any updates on that? Not able to see a reply option on that chain message , so posting it again here separately. We have checked this on many different browsers and it seems to be working fine. Note sure which images you are talking about. Let me check this right away! Sorry for bugging you too often, just to let you know the issue still exists for me. Really sorry, we are uable to figure out the issue. This is working absolutely fine with all of us here. I’m using chrome and is able to read the questions raised in comments however no charts are visible… Request to kindly sort it.. I use Chrome too, Senthil. I can see the charts. Can you please do a hard refresh of the browser once? Thanks. what will happen with allotment of equity shares ?>will it leads to decrease or increase the price? Hi Sir, on the topic of ” whenever a doji follows a recognizable candlestick pattern, the opportunity created is bigger.”My query is can the candlestick pattern be single pattern followed by doji also give bigger opportunity? also what should be the volume on p3? should that also be above 10 day average volume. Thanks. Yes it can be. Volume on P3 has to be higher than 10 day avg. Rule snout the stop loss is described, but what shall be target is not explained. Is there any rule for the same. Well, the immediate resistance could be the target. what if a doji is formed after a bullish engulfing pattern , will the consecutive sessions form blue candles??? Thats the general opinion and I’ve explained the logic as well as to why traders think so. The subject presented is very good and useful to beginners.I have gone through many books but are very exhaustive and this material is exceptional and very useful.Koodos to your effort. I do see a BE pattern, but not sure if both of us are seeing the same. I’m referring to the 6th and 5th candle from the right. which time frame suits best to identify engulfing patterns ? TA works across all timeframes. My personal preference is to look at EOD data. However, if you can choose to work with 5,10, or 15 mins candles for intraday trading. Sir,Please confirm that M&M has formed a Bullish Engulfing pattern with good volumes? Help me to identify the Support and Resistance, As of my knowledge Support at Pattern low and Resistance is at 1350 to 1370? It seems to have formed one. I can help you if you have been stuck somewhere, so please do let me know which part is difficult for you to understand. Can’t upload the attachment here? You can I guess, many folks here do that. Do you think NIFTY has formed a piercing pattern on Dec 5 ? No, because of the absence of a prior trend. Hi Sir, can you please clarify if HCLTECH on Dec 16 formed a bearish engulfing pattern with volume above SIMPLE 10 day average. This is on a daily chart. Thanks. I am not seeing a place to upload the screenshot. apologies for the inconvenience. Thanks. Yes, it seems to have formed one. Good luck. Would like to ask that at 8.4 the presence of doji u mention about the chart but there is no chart visible. This has happened earlier as well sometimes. One more thing sir I m not able to distinguish between an online and offline broker as both give almost all the services barring the trading tips. Can u please help. I’m able to see the chart Mehul, can you please refresh your browser again? An online broker renders all his services online, however an offline broker has physical office, and services are rendered both off and online. The world is moving towards online services, it is more efficient, transparent, and quicker. I’d suggest you opt for an online broker. To see/read such content, it’s wonderful. I hope this will be bringing a lot of business to Zerodha. My Q: to start with I am a rookie, but i have this basic concern about the highest/lowest as the stoploss in bearish/bullish engulfing pattern. Why high/low respectively & not any other value? need a little clarity around the same. Thanks in advance! High / low are crucial turning points for the stock….at these points the sentiment changes. Hence the importance for these price points. What exactly is the thought process for piercing pattern and dark cloud?? 1)can we use MOVING AVERAGE for confirming the trend? If yes, than what would be the paramaters? 2)For intraday trading whether to identify trend on EOD , HOURLY, intraday chart? 2) I’ve answered this earlier. Hello! A fabulous guide thanks for the effort! Yesterday I saw a Marubuzo being formed in SBI so I expected it to be a bullish day today as the support and stop loss was under 4% difference and even the volume almost near the avg volume(not touching the volume SMA). But yet it just went the opposite direction today. What could be the possible reason for this ? Also, I saw a piercing pattern in SonataSoft which was followed by a doji, so as you’ve suggested that a doji highly increases the chances of a trade going in the pattern direction I expected this to go bullish today, even the support was under 4% difference and volume was almost close to the avg volume(not touching tho). But today it went the opposite direction. What did I do wrong ? A general question – Consider a hammer has formed, the subsequent candles are green and the volume stays above average for 2 trading sessions but after that the volume gets below the average volume on 3rd day(the candle is still green). So, does it mean that the pattern trend is diminishing or weakening ? SBI trade is still valid right? SL has not been triggered yet. Sonata is not a valid piercing pattern…there is no prior downtrend. No, you look at the pattern and associated variables on the day of initiating the trades. Once trade is executed, only thing you need to look out for is price moving to either target or SL. In Sonata, is the downtrend there only from mid 7-14th date ? After that it went kinda straight so thats why it isnt downtrend ? I check all the variables for it to be a valid trade as per the checklist, if it is I buy/sell the stock next day as MIS and try to get whatever profit it makes in that by the EOD. Because the downtrend has to have at least 4-5 consecutive downtrend session, contributing at least 5-6% down move. If you are starting fresh, I’d suggest you not take excess leverage with MIS. Look for overnight opportunities. Thanks for the explanation but here in this chart of Cairn you said that it was a correct uptrend but before the shooting star(marked with arrow) there are only 3 candles behind it. Please guide me with the trends(if they’re even right) by the numbered lines. Sorry, I cant seem to understand the charts you’ve posted. 🙂 Please tell me about these candles, it’s going up but I couldn’t figure out what trend is going on right now in them(if any) ? Looks like the secondary trend is taking over the primary. What I meant was there are only 3 candles behind the shooting star then how is it an uptrend as you’ve mentioned earlier ? Did you check the percentage move? Yes, the % change is 5.1% for the Cairn chart, but still arent the candles low in number ? And sorry but I didn’t get what secondary trend taking over primary meant. Do you mean that the primary trend which was up has ended as several red candles are taking place after every few green 1s ? Yes, it means the primary trend is weakening out (for the time being) and the chance of secondary trend dominating the market is high. As I tried to trade intraday for a few days following the chart patterns for practice I noticed this bug/shortcoming that the formed candles are not always correct. So, I started reloading chart every few seconds to be sure(which is quite a pain :L ) that the formed candle is correct but even then some candles pattern change after a while..What is the solution for this ? Because in 5 minute candles you gotta buy/sell quickly as a pattern forms and if the pattern formed is faulty it’ll result to a wrong trade. Till now I’ve initiated wrong trades twice due to this problem. Nothing wrong with the charts. Anyway, base your trades in such a way that the you initiate the position at the completion of a 5 mins candle. Yes, I do buy at the end of a 5 minute candle(like 10-15 seconds before the creation of a new candle). Proof of what I’m saying on Kite and Pi… if the charts keep changing like shown in the photos below then how am I supposed to start a correct trade because who knows in 2-3 minutes the candle would change into something else ? Can you please email [email protected] for this? Mail sent to the email with the chat transcript. Amar Raja was in downtrend for a while but from last 4 trading sessions it gives a signal of uptrend as of my knowledge, But Yesterdat again it has formed a Dark Cloud Cover Pattern with low volumes, So can i consider it goes down? What are all the possible outcomes here? Is multiple candle stick pattern mostly used for two or more trading days? Its used across many time frames – starting from intraday to multiple weeks. 1. Is it possible to check all 50 shares in 15 minute time frame. If yes then how. Or any other alternatives. 2. For the swing traders like you have mentioned if there are positive pattern to enter into the trade at 3.20 pm, however for 15 minutes trader at what minute he should enter into the trade. 3. For intra day is better to be a risk trader or risk averse trader due to less time frame. 2) 3:20 PM can be set as the hard stop for markets for taking positions, does not matter which time frame you are following. 3) Intra day by definition is a risk taker. My question is, do we have any module where we can find how to set Target, as you taught us how to set stoploss. how to attach a chart image in the comments ? I think the upload feature has been disabled for security reasons. I was looking at the chart of Axis Bank for 11th (P1) and 12th Apr (P2). Based on that I have few questions. What should be the length of the P1’s real body in proportion to P2’s candle? (A) P1’s length be slightly less than the P2’s candle (B) It can be of any length but shorter than P2’s candle? What if P1’s candle is already a recognized candle stick pattern like Marubozu, spinning top, Doji, paper umbrella or shooting star. In this example, on P1 candle is a spinning top and is a blue color candle. So in this case, should we ignore the P2 candle and read the chart based on P1 candle only? OR combine the P2 candle with P1? Does all the candles in a chart have a recognized name? Does the candle of 12th Apr form any recognized pattern? As per my understanding it is just a long red candle. Thank you in Advance. I have tried to make my query as clear as possible for you and other readers. A) Can be any length but shorter than P2. B) Does not matter – its best if both P1’s pattern and P1 and P2 together point to the same possible outcome. However, I wont read too much into the colour of a spinning top. 1) There are multiple patterns, practically impossible to know everything. However, you need to eventually start relating to the price action behind the candlestick patterns. Pattern names dont matter much. isn’t it a formation of hammer instead of bullish engulfing pattern. if is not, please explain. P1 is a hammer. P1 + P2 together form a bullish engulfing pattern. This varsity is really informative and easy to understand. I have a query. in the Engulfing patterns, In intraday, how can an trader be risk taker at 3:20 on P2. I mean at 3:30 markets close and why should a risk averse trader wait till 3:20 of next day of P2, can he not validate this pattern after market close on P2 and go long next day. Technically, the trader is expected to take the position after he gets a confirmation of the pattern on a closing basis. 1. Is it a correct pattern that I have identified? 2. If yes, any reason why is it going up today? If possible, I’ll try and upload a file for it. 2) TA does not guarantee a movement, it only enhances the probability of an event occurring. Thanks for the confirmation Karthik. Is it possible that for bearish engulfing pattern(or for any pattern for that matter) the stock will go down even if the pattern is broken today? If yes, what is the max. no. of intervals we can consider (like 1 day if considering EOD). Yes, I usually keep the pattern under radar for 2-3 trading sessions. the chart https://ibb.co/ieQcfk shows formation of the hammer after a downtrend of 5-6 trading sessions but the volumes are not above average of last 10 days so the hammer pattern is not credible hence ignored, but at the end a bullish engulfing pattern is formed with volumes above the average of last 10 days however the next days (last day on chart ) a red candle is formed. My question is, can this pattern qualify as a bullish engulfing pattern? the prior trend should be a downtrend for a bullish engulfing pattern. is the prior trend enough downtrend for the formation of a bullish engulfing pattern ? should the trend after the hammer formation be only considered for bullish engulfing pattern (they are all red candles but mostly are spinning tops) or the downtrend from around 67.50 after which hammer pattern was formed should also be considered? Tricky, I would not really qualify this as a bullish engulfing pattern due to the lack of prior trend. But then, its all about being flexible, I may have considered this as a trade, but would have played safe with an options trade. have not reached the options module yet, but will get it soon. for now it seems every pattern i find it fails and trades in the opposite direction. when a bearish candle is formed, the opportunity is to short the stock and risk taker would do it on P2 day itself. But aren’t we supposed to square off the short selling transaction on same day itself? Short position in futures can be carried forward till expiry. Today TCS EOD forms the pattern of doji and earlier it formed a dark cloud cover. Also volume is more than 10 day avg. Does it confirm that TCS will fall from 2446? In the example of piercing pattern example u have mentioned that if P1s range is 12, P2 s range should be atleast 6 or higher but below 12. Shouldnt it be If P1s range is 12, P2 should engulfs atleast 6 or higher but below 12??? The idea is to ensure that that the range of P2 is at least 50% of P1 but lesser than 100%. If it is 100%, then that is essentially an engulfing pattern. can u plz tell me how authentic is the screener website? have u used it? Is PDF’s of Varsity content removed from the site? If not, could you please provide the link? It will help me to use it in my Kindle and refresh while I am in commute. We will bring it back. can you please check the attached chart in https://ibb.co/mEMvCF . I could see that the stock has formed Bullish Engulfing pattern on 4th Aug 2017.Kindly confirm.Also how to set targets for such trades when there are suitables resistance points? Yes, it is a Bullish engulfing pattern. One of the easiest way to identify target levels is by tracking the resistance level. I have posted a query with a image url on 5/8/17,but seems the comment is deleted..
No, it was not approved then I guess. A question: for Bearish engulfing pattern, If we do shorting at the end of P2, then can we carry it( the trade) forward to next day or more number of days in order to square off. I have understanding that shorting is an intraday activity, please correct me if I’m wrong; A beginner. Shorting in the spot market is an intraday activity. However, you can short and carry forward the position in the futures market. I was going through chart of ACC . I have a query on that .Should i consider a drop of 5% price (in 8-9 trading days)in previous trend to satisfy for a bullish engulfing pattern .Or should the drop be grater than that? I didn’t catch it properly. It is for the same reason! Can we use the chart patterns for the Nifty 50 Index and buy or sell Nifty 50 Index option contracts accordingly like how we do for the stocks? Yes, thats it needs to be done. So is the nifty driven by the people selling or buying the nifty 50 index futures/options itself or as a result of the performance of the 50 stocks under it or both? Hope you got the intent behind the question. Asking since I thought the pattern is not determined by the buying or selling of the nifty index themselves but because of the stock performance under it, so how will the candle stick pattern correctly work in general when playing nifty index (since the 50 stocks are diversified from different industries and hence there can’t be a general trend), it won’t work right? This is exactly the point, the collective action results in the index movement and is further summarised as OHLC, which is represented in the candlestick format. Ok so when I trade in the Nifty 50 Index in derivatives segment, if say I trade in Options, the demand affects the option price right, if more people buy the option price may go up and the trade might not be much profitable, so is it safe to say that its always beneficial to trade in Futures than in Options when I know for sure where the Nifty index is headed? Not really, remember, for every buy trade there is a counter sell trade. what u mean by session here? 1 trading day is also called a trading session. It’s so nice to see that Kartik still takes time out to reply to the queries. Just wanted to know what drives you to be so motivated after more than 2 years. You are just great who even after being so busy takes out time to help others we are really grateful to you. I have one confusion sir as you had explained in the beginning of this module in a chapter that when there is a buyer of a particular share at the same time there is also a seller to sell the share and the trade is carried out between them. So my question is if there is same amount of buyers and sellers in the market how are the prices drived from going up and down please help me with this. This depends on the market sentiment. If the sentiment is bullish, then the sellers will quote higher prices and buyers would not really mind paying higher prices (therefore the price tends to go up). Likewise, if the sentiment is bearish, then the buyers would be willing to buy by paying lower prices and hence the price starts to move lower. Sorry for the naive question but can positional trade be shorted? When is it shorted, what is delivered to the person who buys it until my target is hit or stop-loss is breached? If you short stocks then it has to be squared off on an intraday basis. However, if you short using futures, then you can carry forward the position overnight. Hi, In lot of places you have mentioned to enter the trade(Short) at 3:20 PM (for Risk Taker). As far as I know short trades have to be squared off on the same day. So how does one go short beyond 1 day. Thanks. Thanks a lot Faisal. That really helps. Zerodha Varisty is a very nicely curated learning material and easy to understand as well. My question is whether these technical analyses patterns apply to the option premium charts as well? It is not a good idea to do that, Palash. Premiums are driven by multiple forces and not just direction which the chart captures. How can i apply these patterns for intraday trades as positions have to be squared off on same day after initiating trade at 3:20pm. You can always base your trades for the day based on the previous day’s pattern. Which software is good for scanning live candlestick patterns currently formed or forming in Cash and Derivatives and MCX market such as bullish engulfing, hammer etc. Please advise the cost per month as well if you have any info? The DLF Nov future today forms a bearish engulfing with doji. Will it tantamount to larger decline tomorrow? Generally true, but I don’t really see a bearish engulfing here. We have a bearish engulfing pattern followed by a bullish harami in the recent two-three trading days. What is the usual sentiment in such cases? Being a risk averse trader, I presumed the price would go down, however, with a bullish harami the situation entirely changed. These are confusing positions in the market, please help me understand this situation and how do we read such patterns. Always look for the prior trend. If the prior trend indicates bearishness, then I’d go with the pattern which indicates a bullish reversal. Vice versa. Prior trend for how many days? Assume we are doing swing trading for a week. At least 5-8 trading sessions. You have illustrated that whenever a doji follows a recognizable candlestick pattern,the opportunity created is big ,I have a doubt that say in bearish engulfing pattern,if there is a Doji on P3 ,doesn’t it mean that the bear are not yet strong even after forming the engulfing pattern on the P2? This doubt arises because in one chapter you have mentioned that “hammer is more better than hanging man since bears couldn’t take the control yet that why the price goes up again”. Yes, confusion prevails and this is exactly what makes the presence of doji so powerful. Remember, confusion creates panic, and panic leads to bigger price movements. What target do we set for bullish and bearish engulfing? I guess you have mentioned only about stop loss. Also wanted to know a tentative investment period in the above patterns..
Stoploss is based on support and resistance (at least one way to look at it). I’ve explained this later in the chapter. You hold these patterns, till about the time your target is achieved. hey sir first of all really thank you for assembling such a great content at a single place. Sir my doubt is that during watching for multiple candlestick pattern should we ignore the upper and lower shadow and only consider the body? I’d pay more emphasis on the body rather than the shadows. However, shadows too are important. 1) What if the P2 day of the Bullish engulfing has a slight gap up opening(say a 0.1% to 0.2%) instead of “Second, the open on P2 should be equal to or lower than P1’s close” .Can this be taken as a positive factor to enter the trade,if all the other checklist item are positive? or it isn’t a bullish engulfing and should we avoid it? 2) If so we can enter a trade for a bullish engulfing pattern with slight gap up opening on P2 ,then what about a large gap up opening (say more than 0.5 % to 1% or even more),can that to be considered as a good signal to enter the trade,if all the other checklist item are positive ? or these trade to be avoided? 1) Yes, you can accommodate this as a bullish engulfing. Remember, candlestick pattern permits you some flexibility. 2) Not really. Remember, P2 opening should be as close to as possible with respect to P1 closing. what is the reason for the second answer.Why isn’t that gap up opening can’t be taken as positive factor? You can, but that will no longer be a bullish engulfing pattern. That was simply a great document which you made.Really simple and illustrative,hats off to you. I can see that a bullish engulfing patter was formed in Tata Motors on 30-12-2017 and the trend continues as per your description of the pattern .Now as the pattern goes this trend i.e the uptrend is suppose to continue.Would like to have your comments on this . Well, if all the items on the checklist is checked, then the probability of a continued uptrend increases. But ,there was an unanticipated fall at the end in the stock today .This I guess represents the classic case where we have a bullish engulfing patter but still the stock feel ,though after initial gains in early hours of trading. I would like to know how are we suppose to anticipate the movement tomorrow in case such situation comes into play. Sometimes the pattern looks so convincing, but then the market is full of surprises! Do candle stick patterns apply for any quanta of session or is there a limit on that? For eg. Can I go with the candle patterns formed hourly? Is there a limit on min or max duration for candle stick? How duration size impacts candle stick patterns? Candlestick patterns or in fact any Technical analysis principles can be applied to any asset across any time frame. What time frame use to study market? Really depends on your trading frequency and risk appetite. If you are looking at short-term trading then, maybe something like a 5 or 10 mins time frame may work…if you are looking at longer term then something like end of day works. I got confused in short forms used like P1 & P2. It seems like P1 is for hole day pattern of day 1 but at some places its seems like P1 use to talking about one single candle. In P1, p stands for the pattern and 1 stands on the day pattern has formed. So P1 means the 1dt day of pattern formation, P2 for the 2nd day of pattern formation etc. The example shown in Dark cloud looks more lo Bearish Harami… why can’t we consider it as Bearish Harami? Not really, P2 of bearish Harami pattern is completely contained within P1, whereas in DCC, P2 is just halfway through within P1. While we trade using candle stick pattern and there is sudden general but important news (i. e; unfavorable Standard and Poor rating for India or India’s rating downgrade) which may cause the stop loss to hit due to overall fall in the market. In this event should be temporarily remove the stop-loss as there is nothing wrong with the scrip but just the overall sentiment of the market caused the fall in the stock? As long you have the conviction to hold the trade, you should. But remember, your conviction is also a function of how well you can factor in the macros. What is P1 and P2 in this case and how do we establish that the day is bearish or bullish? P1 refers to the first day of the patter occurrence and P2 refers to the 2nd. You combine these patterns to identify if the outlook going forward is bullish or bearish. The first day of the pattern (P1) should be a red candle reconfirming the bearishness in the market. What really is the meaning of this? It means just that – the price action should confirm bearishness. Awesome study material and you have the gods gift to explain things in a simplified way. May God bless you ! I’m a newbie to this forum and stock mkt. Thanks for the kind words, Chimbu. Unfortunately, you cannot upload charts in the comments section. Dear Sir, I have a doubt with regard to the first chart of this chapter (Biocon). In this chart the 10,11,12 candle from the left show no movement at all, its been stagnant that entire three days. Could you please teach me Why and How this happens? Hmm, if this was any other stock, I’d attribute this to no activity. Cant really do that with Biocon. I suspect that is some erroneous data. Dear Sir, I found the same pattern of candle stick with Just Dial futures (15 min chart), should I consider it as no activity or an error? Ah, you can ignore this on intraday charts, Daniel. In 15 min or 30 min intraday chart, sometimes rule 1 that is buy on blue candle day may be violated. Can this come under flexibility in the context of small time frame trades. Or Rule 1 is better to be followed in small time frames also? On 08-02-2018 Tata Steel formed a bullish engulfing patter and the the very next day i.e on 09-02-2018 we saw the trend continues i.e the Bulls took the stock up. I just want to know how we find out till when this upside move will continue .Whether the next trading session will be dominated by the Bulls or the Bears will come into play. You cannot really predict this, Rohit. The candlestick patterns only enhance the probability of the trade turning positive. There is no guarantee that the price will move in the desired direction. 1. Can you please tell me if these patterns can be applied to only intraday charts that is 1, 3, 5 or 15 minute charts (which is the most suitable among these based on your experience) or can be applied to 1D, 1W, 1M charts as well? 2. If I use this on, let’s say a 1D chart and I find bears will dominate, how do I go short? I thought we can only short on intraday trades. 3. Can you also tell me how to set the target price and how long we can hold the stock? Suggest you read the chapter on support and resistance. Like I said, read the chapter on support and resistance. 2) YOu can short the futures. I tried to post the screenshot, but it just won’t happen. I would appreciate it if you could let me know how I can send you the same. Try uploading on Gdrive, but don’t include too many links in 1 comment, it may get blocked. Sir. Can i call this The Piercing Pattern? Would have been happy if it had moved slightly higher, but anyway, yes, I’d consider this a piercing pattern. Today HCLTECH has formed bearsih Harami. Am i correct? Assuming all other checklist is satisfied, one should short the trade. But at 3.20 pm i cant short the trade. Shorting on intraday is working but that wont be the scenario in the articles. what should i do here. Going long is clear for me. Going short it what killing me as i am unable to do. Please help me in this Karthik with some clear answer how to go ahead on shorting. Nope, like I said, there is no prior trend. Bearish engulfing sits at the top of an uptrend. There is no prior trend, so not a pattern at all. For a pattern to be considered, the prior trend is extremely important. In the absence of this, it is not a pattern at all. I have opened an account with zerodha 1 year back and then I came across Varsity. I am glad to have access to such an insightful content. I thank you (especially you because I already consider you my Guru, not just in words. I’ve watched your videos on youtube about – How Much Money Do You Need When You Retire and Reading Cash Flow Statements and analysing a company. Sir all the information and knowledge you deliver goes straight into the head. It is absolutely crystal clear) and your team from the bottom of my heart for all the efforts you have put to educate people on stock markets. 1) Other than Varsity should I also refer some books available in market on value investing etc. or is varsity content sufficient for a novice like me? If yes which books would you recommend? 2) I have opened account for equity as well as Commodity but I have no knowledge of Commodity and F&O markets. Should I first learn everything about equities and then step into Commodity and F&O or should I simultaneously learn that too? Is it true that the equity market is safe if I go through the fundamental analysis? 3) Should I completely avoid Intraday trading as a beginner or it shouldn’t be done at all at any stage? 4) In the technical analysis I understood the stoploss we should place while buying a stock so that once the trade is started either target is achieved or if the stock goes down, the stoploss is hit. The confusion is the stoploss while selling. I didn’t understand how is stoploss used while selling. I would be grateful if you reply to my queries. Akshay, I’m so glad you liked all the content on Varsity. Thank you very much for the kind words. 2) Yes, that sequencing will certainly help. There is nothing that can be considered safe in markets, they all come with its own set of risk and reward characteristics. 4) I’d suggest you read the chapter on shorting, this will give you a sense on how shorting works and therefore the stoploss placemenet. Yes, this is a bearish engulfing pattern. Sorry, I’m unable to get your question. Can you kindly rephrase? how can u enter a short trade at 3:20 pm….isn’t it too close to the end of the day to be able to square off? You can always take a position in futures. In the bullish engulfing pattern’s last chart.Can we consider the red candle as a hammer? That is an inverted paper umbrella – sort of a shooting star. very good book very nicely written. Recommended for absolute beginner who want to learn basic to advance. If Presence of doji forms a big red candle in next day how is that profitable? How is this a good opportunity? You should not look at it as an isolated candle. Look for it in the backdrop of the other candles and see what the price action is suggesting. I am sorry Sir.I did not understand what you are trying to say here. Meaning, you will have to take a holistic view of the candlestick pattern, and not just one candle, especially if it is a doji or spinning top. I must say, the modules are amazing for starter like me. Your way of teaching is amazingly unique. Thank you so much. I have a question. Let’s say, I placed a trade based on Bullish Engulfing Pattern and Market moved in favour and after few sessions (1 or 2 trading sessions) I saw Bearish Marubozu. What should I do? Should I exit ? What to do in such cases, where another recognizable candle stick appears before my Target is hit ? Here is the thing – once you enter a trade, you hold on to it till your target is hit or till your SL is triggered. Even if you see another pattern emerging. Please help me out in understanding, what does the day means does it mean next day or next candle and why should we check the time at 3.20 pm before entering the trade after we see engulfing pattern.. I am confused. Engulfing means is that the P2 first candle of the day should engulf the P1 last candle of the day? ok, it means when you see the chart of a single day candle? It means the 2nd days candle (P2) should engulf the 1st day’s candle (P1). Sir, is the chart of Coal India satisfying Key takeaways no.9 – The presence of a doji after an engulfing pattern tends to catalyze the pattern’s evolution? Thank you Mr. Rangappa. I am currently long on Coal India. Should I add more here? Kindly advice. Please make sure all the other variables comply with the checklist. Remember your stop loss. Also, since the overall market is weak, you may want to consider taking an options trade on CIL instead of futures. Good luck. Hello sir, please correct me, is on 26/6/18 in coal india stock the bullish engulfing pattern was formed. As there was down trend, 26/6 candle was green, 27/6 was green too. Volume was above average, perfect for long position. But 28/6 is red candle. Rohan, the patterns don’t guarantee outcomes. They only increase the odds of a profitable outcome. 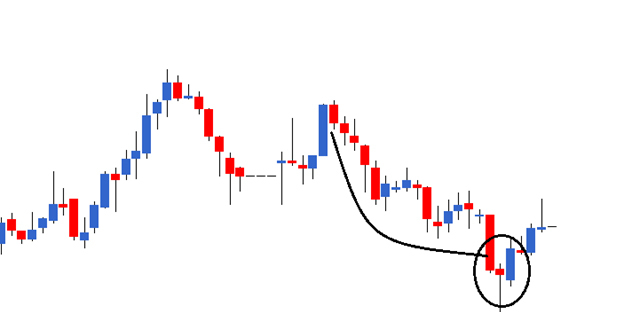 I came across an interesting candlestick while going through the charts of TataPower, please check the link for it. I have marked the candlestick with a rectangle. The OHLC data has also been highlighted for reference. I can’t comprehend the happenings on that day. How can a stock open at 0 when the previous day it was trading at 84.85? Even if the close on that day is 84.85, then how come the high is 0? Even if we consider the candle as a Marubozu, then the high and close should be equal, right? How come the price could jump from 0 to 84.85 just because of a volume of 100 shares? So how to understand what exactly might have happened on that day? Tata Power went through a category change on 14th May 1999 from EQ to BE. As per the bhavcopy for 17th May 1999(next trading day), the previous day’s close was captured as 0 instead of the price it closed on 14th May which has resulted in the erroneous candle being formed. The above information has one statement as ‘Later in this module I will introduce a 6 point trading checklist. ‘; however, I could not see it at end of this module/chapter. Can you please let me know which topic I need to refer. There is an elaborate checklist towards the end of this module, Harshajeet. Request you to please look at it. Thanks. Would the patterns formed on 25-Mar-1998 and 26-Mar-1998 in TataPower,together, be qualified as a Dark Cloud Cover. Also the same for 04-Aug-2003 and 05-Aug-2003. More importantly, I want to know whether the trends before each of them can be called, Up trends? I’ll have to dig through the charts for this. By the way, why are you looking so far back in time? No worries. I was just trying to see how effective the engulfing pattern has been throughout the history of TataPower. Secondly I attempted to spot as many instances of the aforementioned patterns, as possible. Probably I am being a little naive here, but I was trying to check how frequently, these patterns caused a price reversal. What if we get a Doji after bullish engulfing pattern, it means that there is a chance of greater upmove? I am sharing an instance of what I think is a Dark cloud cover and think that it is a short call. Could you please share your thoughts on it? Certainly looks like one…but volumes a low? Since it’s well above average, I reckoned it should qualify. Yes, if the volumes are above average. I have spotted what I think is a Dark Cloud Cover in the BajajAuto charts for just yesterday. My opinion is that shorting can be done here. Sir, does imfa forming bullish engulfing pattern on 17/7/18..
Yup, it certainly looks like one, Roshan! Should I complete all modules in order to start trading in equities or can I start trading after completing till technical analysis part only in this varsity? Also,can you share your trading story? You can certainly start after going through TA. what if in “bullish engulfing pattern” PR2 is red and engulfing PR1 (Also red)?..after looking this can we say ,this pattern is ostensibly bullish?…. I’d see this as two strong bearish candles, Amandeep. Think about it, if P2 is bearish, then the stock opened lower, made a new high but was unable to sustain the high, hence closed lower again. In the case of dark cloud cover.. Should P2 has to open above the P1 close price or it doesnt matter? Yes, the opening on P2 should be higher than the close of P1. Thank you so much for giving so much insight on various different concepts. This is the first reading material I am going through and it’s really awesome. I am able to follow along pretty well. We truly appreciate your team’s efforts. In the above chart what could be the pattern, we can conclude for the UpTrend started where I highlighted in Yellow color. It’s definitely not Bullish Engulfing or Bullish Harami pattern. Is the UpTrend started here can be evaluated by any Multiple Candlestick pattern or by a Bullish Marubozu? Request you to please share your thoughts around this. 1) Was it a solid support area, which was tested and the stock bounced back? 2) Was there a double or triple bottom being formed? Karthik can you take a look at the below attached screen shot of Cipla ( as on 24/08/2018) ? Looks like an engulfing pattern? Hey Karthik, can you take a look at the following charts ? 2) Yes, it is a shooting star. Please make sure the other variables are in place before you place a short order. Hey Karthik, I have initiated trade on both Cipla and UPL but the trades have gone against me unfortunately. Why is it so ? Ajinkya, did you check all the other variables mentioned in the checklist towards the end of this module? I am afraid that I didn’t. Since it was a bearish engulfing pattern I executed the trade. hmm, you need to stick to the checklist be a more probable outcome in your favor. Is there any difference between a tweezer top and dark cloud pattern? I guess tweezer tops have a similar opening on P1 & P2, while DCC have a difference in the opening. Guess this is the only difference between the two patterns. I guess there is some fundamental factors at play. Request you to please double check that. If a bullish engulfing pattern formed n on P3 red candle formed but upto the midline of green P2- is the pattern still valid?? As in 8.4 here , National Aluminum Co. Ltd (Nalco) formed the pattern (Doji after Bearish Engulfing) on 7thSept and took the Short position. But today I don’t see any major changes in the stock. Could you please confirm whether I followed correctly? Karthik, I provided an email address while commenting but did not get notification such someone has reply or similar. Could you please confirm with technical writing team because it is really required. As of now what I’m doing, for example I asked a questions to you in 8 different chapters, and I’m sure you would have reply for all the questions but I need to go all chapters comment section and need to search with my name/query; and sometime it becomes tedious. We stopped this of the same reason! No, in piercing and DCC, the candle on P2 should not engulf. 1. As you said in bearish engulfing, if there is a doji formation on 3rd day (P2) then there will be a long red candle and stock will be bearish for next few sessions. Ques- Is the same thing applies to bullish engulfing as well ?? 2. How to find the target of all the single and multiple candlestick patterns?? Yup, it does. By the way, the presence of doji with candlestick is just my interpretation. You may want to double check this. For targets, you can always use the support and resistance techniques. I am seeing many charts, in multiple candlestick patterns chart, we can see single candlestick patterns as well.. In a chart what should be the priority? single or multiple candlestick pattern? which pattern we should look at first? As the charts are increasing, confusion is also increasing! 2. Is there any priorities for the patterns? 2) Nope, there isn’t any. P2 open should be around equal to or low off p1 close.Is it ok if it has some gapup or gapdown of some % of opening and it forms engulfing pattern as it has formed in yesterday’s ITC stock. Yup, as long as the % difference is not too high. High enough to impact the pattern. And even ioc after some 8-9 sessions of down trend it has formed bullish engulfing with excellent volumes can u please check these charts becoz I’m not able upload the charts here. Is this type of chart can be drawn in Kite or Pi ? If yes then what should I select in type? I’d suggest you select the standard Candlestick charts. So in that case will I be able to see all the candles which are mentioned in above tutorial . I see in other comments section that they are able to identify engulfing pattern. I did not find any way to see two days chart at same level. Is that required some extra software ? No, Shailesh. Each candle is one day’s price action. So if you are looking at 2 candles, you are essentially looking at 2 day’s candle. Understood the engulfing pattern. But which chart shall be considered to exercise the same? The spot chart of the underlying (end of day basis) should give you a good start. In today’s Yes Bank 1 hour chart closing at 10:15, there was a Gap up but the shadow (low) engulfed the whole of friday’s 1 hour candle. Since the bull candle body opened with a gap up and the shadow engulfed the whole bearish candle, can I still call it a bullish engulfing? Or like you have shown in the example of bullish engulfing, the body should engulf the body? Hope you got my question. Ideally, the body should engulf the previous day/period’s candle and not the shadow. can you please explain these if it’s a bearish day how can it be in the favor of risk taker because he will be losing money. Shivam, this is explained in the chapter in great detail. Can you please look through once? Thanks. For a bullish engulfing pattern/ bearish engulfing pattern, or whatever may be the pattern it is! You’ve said that if a recognizable signal occurs then one has to look for buying/shorting opportunities. My doubt here is: I’ve observed different candlestick patterns like 15 mins, 30 mins, 1 hr, 1 day, 1 week and 1 month candles. Each of them are conveying different signals i.e., 15 mins pattern is different from 1 hr ; 1 hr is different from 1 day ; 1 week is different from 1 month. I’m unable to decide which pattern would be applied to the stock during the intraday. If suppose I’m shorting a stock by looking at 15 mins chart, within half an hour or an hour the stock is reversing its direction and my stoploss got hit. This happened to me many times. Need some help from you! Any suggestions or corrections that I need to implement?? 2) Try and look at longer term time frame – for example 15mins is better than 10 mins and EOD is better than hourly chart. Once again, hats off to you and the entire Zerodha team. Teaching people about candlesticks, you guys are really lighting up the candle of knowledge in the dark, gloomy stock market arena. I have recently begun trading and it really seems very interesting, all thanks to varsity. I had a few queries about engulfing pattern, and I’d be obliged if you would answer. 1. If P1 is a doji, or a star,and P2 engulfs in entirely but say, as a spinning top, then does this still qualify as an engulfing pattern? I am asking this since dojis and spinning tops indicate uncertainty in the markets. 2. If say, P1 is not a doji, but P2 is a spinning top, then does this still mean that its a bullish engulfing pattern? As you have mentioned, for the bullish engulfing pattern (or bearish) or other above mentioned multiple candlestick patterns, it is worth to be risk taker than risk-averse and thus trade (take action) on P2. But you have also mentioned the likelihood of doji formation and thus forming even powerful combo to cash on the opportunity. This we can only identify if we wait till EOD P3 and behave as risk-averse. So, what is the right way? Which is more helpful and which one average out (longer run) to be better? P.S: I am still going through the modules and just reached here sequentially. Well, the occurrence of doji or spinning top will not be known until it happens. So if you are a risk taker, the best bet is to take up the trade, if doji, then probably increase the stakes. But do remember, doing so will also increase your exposure to risk, so you need to be within your limits. well i cant see any of the screenshots shared by others in the comment post to analyze the particular trade they are discussing about. Most of them upload to google drive and share the link, Abhijeet. Quick question on Engulfing patterns, is it necessary for P1 to be bullish and P2 to be bearish or vice-versa? What if in a bullish trending market we see two red candlesticks with P2 candlestick engulfing P1? Does situation like these occur (given that P2’s opening will be higher than P1’s opening and (goes without saying) P1’s closing? That fine too, Rahul. The idea is to ensure that that P2’s price either erodes all the gains (bearish) or recovers all the loses ( bullish). The point is to look at the price action and not really textbook defined patterns. In idea vodafone chart, with a formation of doji and spinning tops there was downtrend in the price, yesterday with a increase in volumes there was a bullish engulfing pattern forming , can you please look into it? whether i am interpreting it in a correct manner? It does appear to be a bullish engulfing pattern, however, I’d be cautious with bullish strategies around this stock given the fundamentals. Thanks for replying Karthik Sir. The modules on technical and fundamental analysis as well as options are pretty good. One who doesnot have any knowledge, should definitely refer to it. Sir one my friend has invested in vodafone idea, for the purpose of rights issue, like playing it as a special situation, should one hedge the position or keep it unhedge (average buying price 17.5) . what are your views regarding? Hedging may not be very effective in this case, Gaurav. Btw, the right issue window is over right? You’ve shown examples of how the piercing pattern works similar to the bullish engulfing. Can this work in reverse like a bearish engulfing? Example in an uptrend, does a piercing pattern indicate a possible downward trend reversal? Dark Cloud cover answered my question. Your explanations are so easy to understand. Thanks you so much for writing this module. In an uptrend you need to look for a dark cloud cover for reversal. If you find a piercing pattern in an uptrend, then it only indicates more bullishness. As said examples are daily candlestick or 15mins? If it’s 15mins then how can we identify Bullish/Bearish engulfing? The candlestick pattern works across all time frames and assets. For example, if you are looking at the bullish engulfing pattern, then the previous 15 min candle is referred to as P1 and the current 15 candle (engulfing P1), becomes P2. Thank you Karthik for prompt response. I saw few academic article that show that candles doesn’t work in predicted next stock price. Did u hear about this? And if so maybe u have to say about it.. Yes, for this reason, the whole of TA like any other predictive philosophy is empirical.